TV shoppers looking to find the best option for under $1,000 are on the horn of a dilemma: should you spend your money for the latest 4K UHD technology or opt instead for a standard 1080p set in a larger screen size? The good news is, that we found excellent choices in both categories. We are entering the age of 4K, aka ultra high definition (UHD), TV. 4K UHDs display 8 million pixels, four times as many as current Full-HD HDTVs. More pixels, of course, mean a smoother and sharper image, and you can sit closer to a 4K UHD without discerning the pixel structure, which makes video gamers looking for an intense immersive experience happy. We found an excellent 55-inch 4K UHD being sold for less than $1,000 – the Vizio M55-C2, priced at just $849.00 on Amazon. The M55-C2 offers the largest-size/lowest price ratio of any UHD currently on the market. And it also happens to deliver very high quality picture. According to David Katzmaier at CNET, the M55-C2 "delivers deep black levels and excellent contrast for an LCD TV. Color accuracy and some aspects of video processing are solid, and input lag for gaming is among the lowest we've ever tested." This smart set also includes perhaps our favorite Vizio accessory – a remote control with a Bluetooth QWERTY keyboard, which vastly simplifies smart TV content searching. If size is more important to you than pixels, for just a few more shekels, you can pick up Vizio's larger 65-inch 1080p HDTV, the Vizio E65-C3, priced at $948.00 on Amazon. 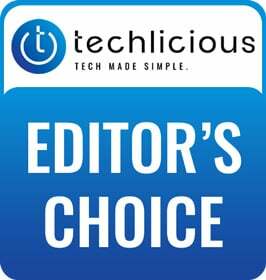 Cedric Demers at Ratings.com opines that the "E65-C3 is a great option for a large TV, particularly because the price is so low. It has really good picture quality, apart from its black and color uniformity, which aren't great. Still, for the price, it's tough to beat this TV, so pick this up if you want great, but not perfect picture at a large size and without spending too much." 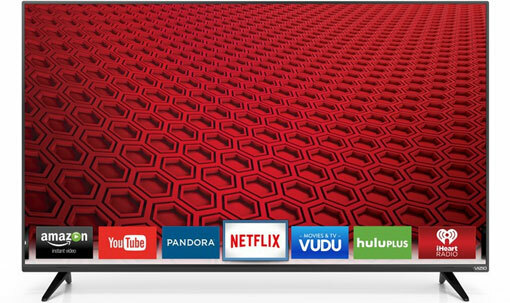 Consumers love the Vizio E65-C3 just as much as its 4K sister, garnering 4.3 out of 5 stars on Amazon, based on more than 1,700 ratings. Both the M55-C2 and the E65-C3 are smart TVs, equipped with variety of Internet TV choices including Netflix, YouTube, Amazon Prime, Hulu and Vudu. As with all Vizio HDTVs and UHDs, the M55-C2 and the E65-C3 are equipped with full-array backlighting–a grid of LEDs behind the LCD panel–rather than the less effective edge-lit backlighting techniques of other LCD LED TVs. Behind the M55-C2 is a 32-zone grid of LED backlights, the E65-C3 a 16-zone array (more is better). The E62-C3 provides up to 240Hz (240 frames per second) refresh rate to smooth video and reduce blur with a boost to 480Hz for smoother gaming action, and can display 1.07 billion colors, while the M55-C2 flashes at 120Hz and displays 1.06 billion colors. For connecting, the E65-C3 includes four HDMI jacks along with single component video, standard RCA video, Ethernet and USB inputs. There's also analog and digital audio outputs for adding a soundbar. This jack pack isn't necessarily special, but gravy for what is already the highest-value big screen TV on the market. But even with 4K thrown into the mix, we believe the larger E65-C3 offers the best big screen bargain out there because 4K UHD isn't finished yet, so buying one now may be premature. A chunk of the next year's UHDs that will be unveiled at the upcoming Consumer Electronics Show (CES) in Las Vegas in January will contain new High Dynamic Range (HDR) and Wide Color Gamut (WCG) technologies; the former vastly extends contrast, revealing details in brightly-lit or dark/shadowy scenes never before capable of being displayed, while the latter unveils millions and billions of more of heretofore unseen brighter and truer color tones and hues. To convey this enhanced contrast and color to your 4K UHD, all 4K equipment will likely need to be equipped with HDMI 2.0a jacks, which only a handful of flagship UHDs have. In addition, it is nearly impossible to tell the difference between HDTV and UHD sets of 55-60 inches or smaller when watched from a normal viewing distance of six feet away or more, and 65-inch sets from 7.5 feet away (most people watch TV from longer distances). At these distances, a 4K UHD TV may yield only barely perceptible improvements over a similarly-sized HDTV, and only by those with eyes trained to see such improvements. On the other hand, HDR and WCG will make the differences between HDTV and UHD immediately more noticeable to nearly anyone, when they are available. Until then, there's no reason to spend more than $1,000 on a 55-inch UHD when you can spend half as much on a 55-inch HDTV that will look just as good to you (such as the Vizio E55-C1, our pick for best sub-$500 HDTV). If you want a big screen TV now, the best bargain is the bigger 65-inch Vizio E65-C3.